Posted: Friday, June 29, 2018. 11:53 am CST. By BBN Staff: Last night, the United States Embassy in Belize celebrated the 242nd anniversary of Independence of the United States of America. For the first time in Belize, American Marine Guards presented the American flag. Charge d’Affaires Adrienne Galanek hosted distinguished guests including Governor General, Sir Colville Young. 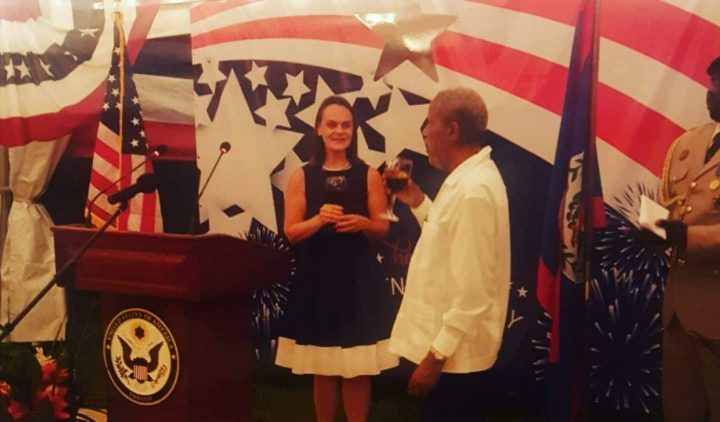 Galanek in her address, highlighted the great partnerships cemented by the US Embassy in Belize and the Government and people of Belize. Other Special invited guests included, Commissioner of Police, Allen Whylie; Belize’s Music Ambassador, Shyne Barrow; Deputy Mayor of Belize City, Oscar Arnold and the Mayor of Orange Walk Town among many others. Also joining in on the celebration was Dr. Paul Whisnant. Whisnant is the founder of International Servants and has served as a Missionary in Belize since 1990, and as the Honorary Humanitarian Ambassador since 2017. Last week, Whisnant hosted a team of 70 volunteer doctors from the United States last week who treated hundreds of patients throughout Stann Creek and Toledo. This week, Whisnant is hosting a team of 30 volunteers who are leading youth programs in rural schools.